This is my first completed rag rug and it was hard work so I don’t think I’ll be making these very often! 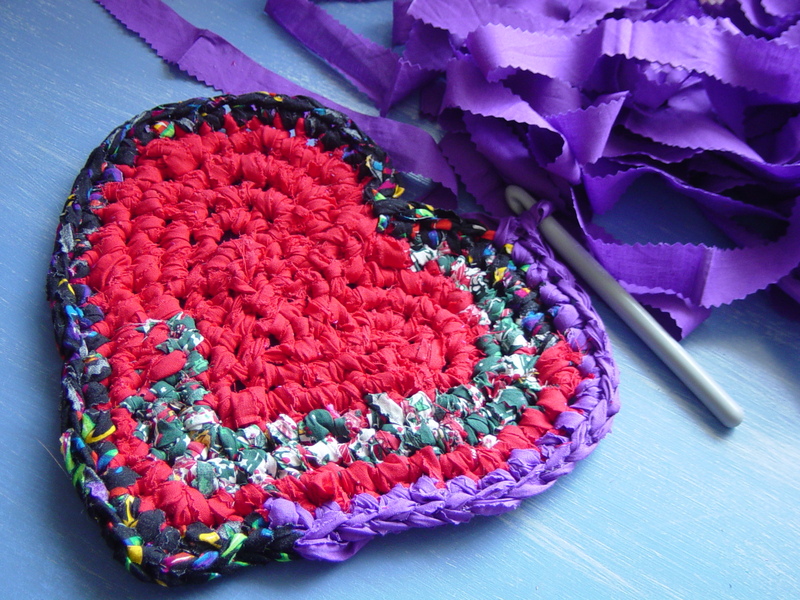 Using crochet to make a rag rug like this uses a lot of material, so I want this to be the only one that uses material that’s not recycled. 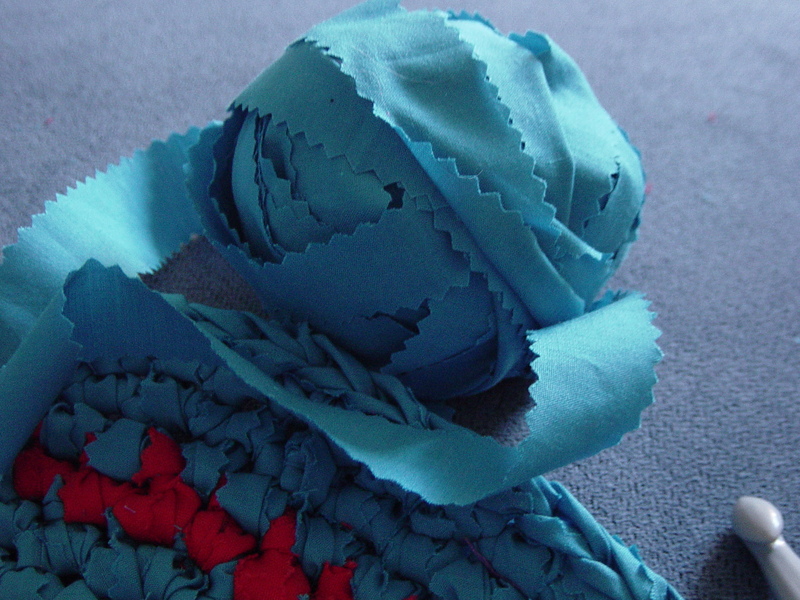 Really, rag rugs should be made from strips of material salvaged from discarded clothes and sheets. But I had a small collection of cotton material squares that I’d been carrying around for ages, so I decided to put it to good use. It’s all the same type of matterial and I think the colours kind of go together. Luckily I have a heap of that blue otherwise this would have turned out a lot smaller. I needed some new mats for the kitchen and knew I could make some from strips of material. After hunting around on the net for ways to turn recycled material into rugs, I found the best one at The Sunroom. My first attempt didn’t work out because the biggest hook I had was a size 6, so I went and got myself a size 10, the biggest one they had at the shops, and started again. Using my new pinking shears, I cut strips of ribbon from the material to reduce any fraying. I cut up one square of material at a time to give my hands a break, but my wrists hurt a little from all the hard work! lol. I spent at least two whole days on this, plus several hours here and there spread out over two weeks. I think this is a great way to reuse material that can be cut into long strips, but only if you’re time-rich like me. 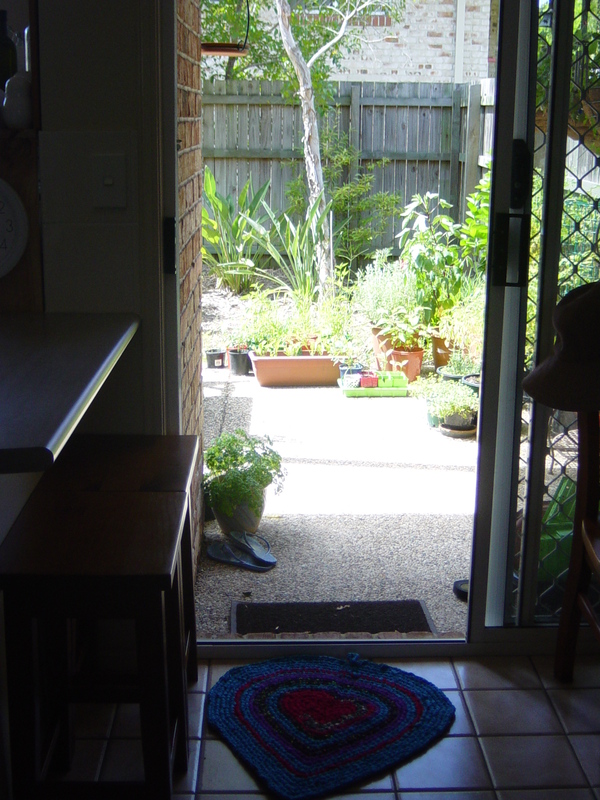 If you don’t have the time, I think paying $10-20 for a small rug from the shops might be worth it! But this is a good way for me to make things for my home without spending any money (other than getting a new hook which I’ll reuse) and using up things that I might otherwise throw away. 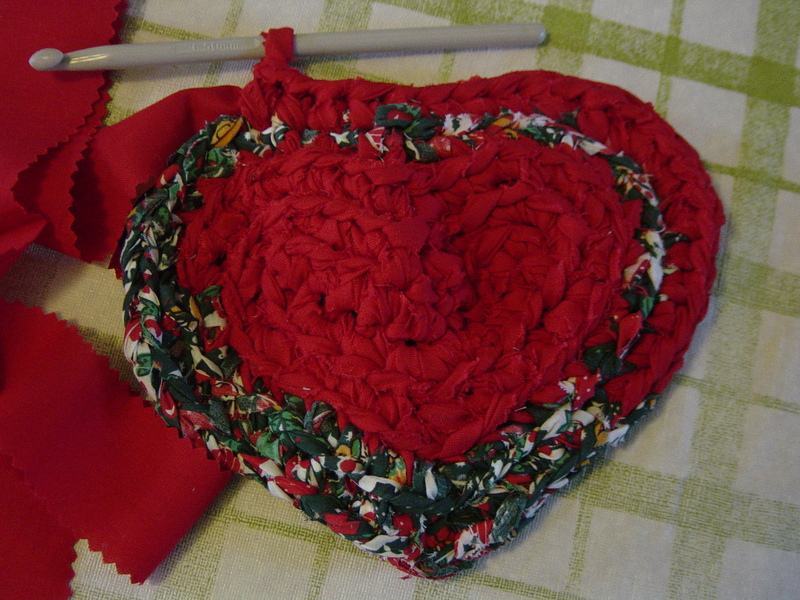 From what I’ve read, this rag rug will flatten out and I can wash it in the machine. This one is about 60cm wide and it’s my Valentine’s gift this year for the home I share with my true love. I started the week off yesterday morning with a quick tidy up and stocktake of my current projects. I had some scraps lying around that needed a home and last week’s scraptrap was currently deployed! 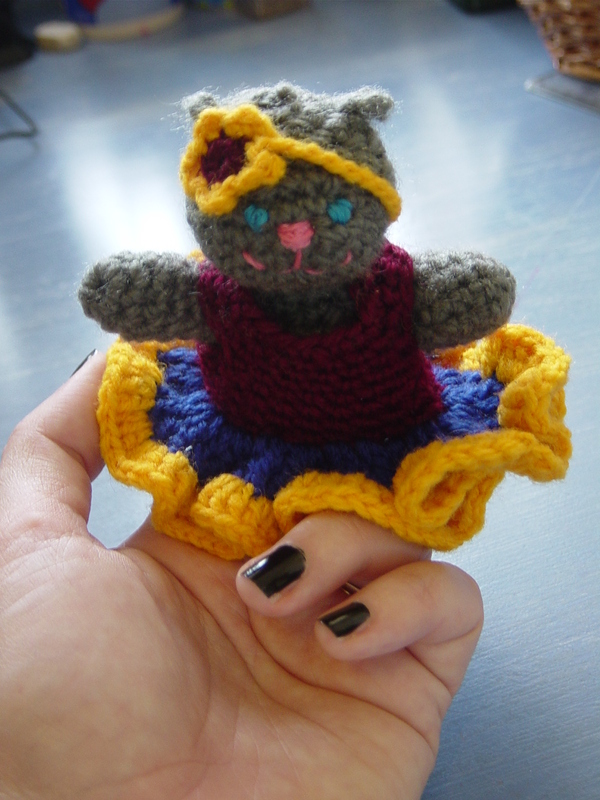 So I quickly whipped this one up, and already its full of scraps and finished to become a lucky love charm or pincushion… or both! I was upstairs in my sewing room and couldn’t be bothered coming downstairs to the computer to check the love heart patterns, so did the only one I could remember from the top of my head. The new scraptrap just had to be a love heart, right? The square based love heart was the only one I could remember, probably because I actually didn’t follow a pattern for that one, its just a square with trebles to form the cheeks. I made one, then did a row of trebles along the side which would become a side panel of the 3d heart. 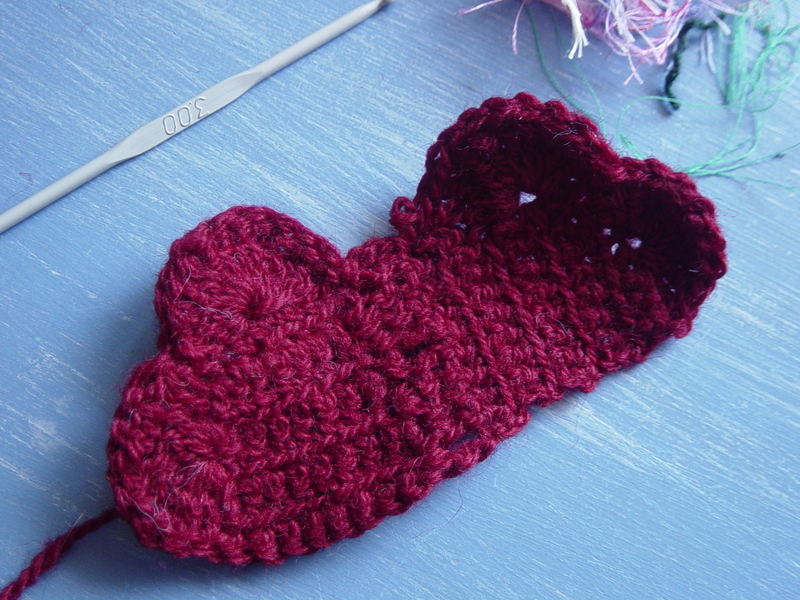 Then I made a second heart, putting the treble cheeks where they would match the first heart. It was all matching up nicely, I just had to sew around the two sets of heart cheeks using slip stitch, then a few more trebles down the other side. I left an opening for the scraps to go in during the day, and also some from today went in. I just closed up the opening when it was full. I added a chain at the top, so if I want to hang it up, like in a window or something, I can. 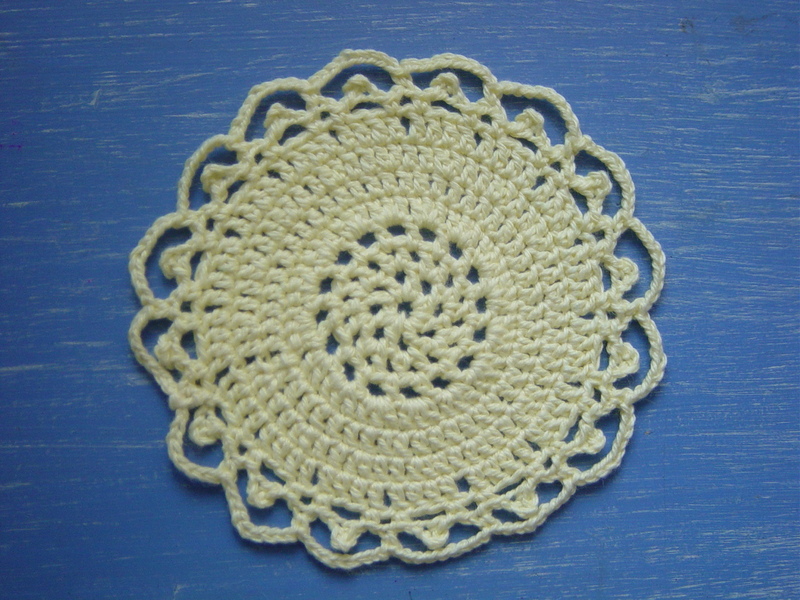 I think this very simple pattern will make a lovely luck charm to hang in our home somewhere, or I’ll probably use it as a pincushion so I can retire the silly old spider thing I made! If anyone would like the pattern for this 3D heart charm, just let me know. I’m pretty sure I could write it out if anyone wanted me to. 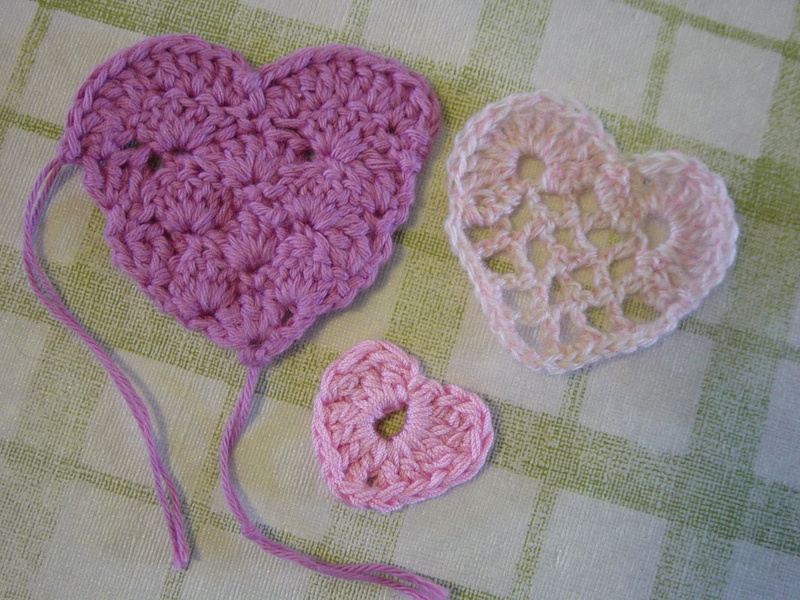 I did up some more hearts for practice, with varying degrees of difficulty but equal in cuteness! 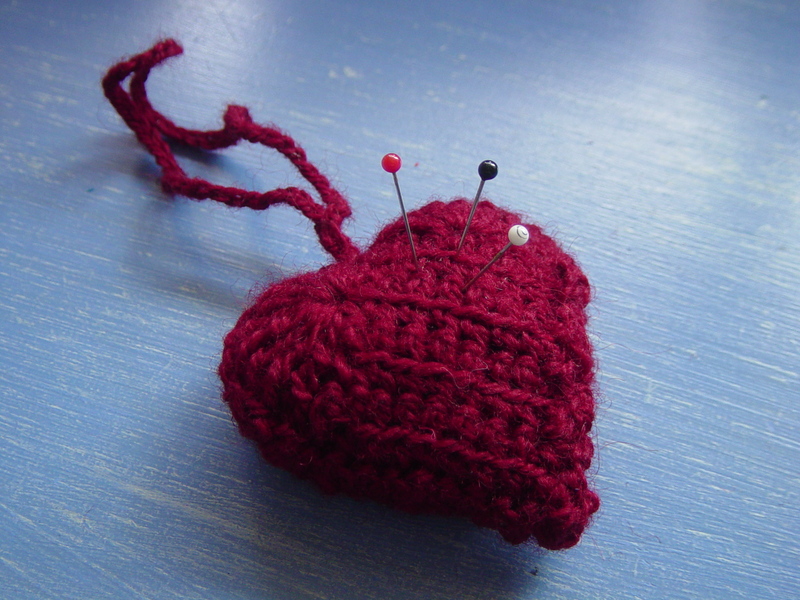 The smallest heart is another go at a very easy heart pattern from Suzie’s Stuff. The first one I did was blue and wonky, so I had another go and this one is much better and very cute. I’m thinking of slipping it in somewhere for good luck, like in David’s wallet or sock drawer! I thought I could try the square lattice heart by just looking at the picture, without reading the pattern. 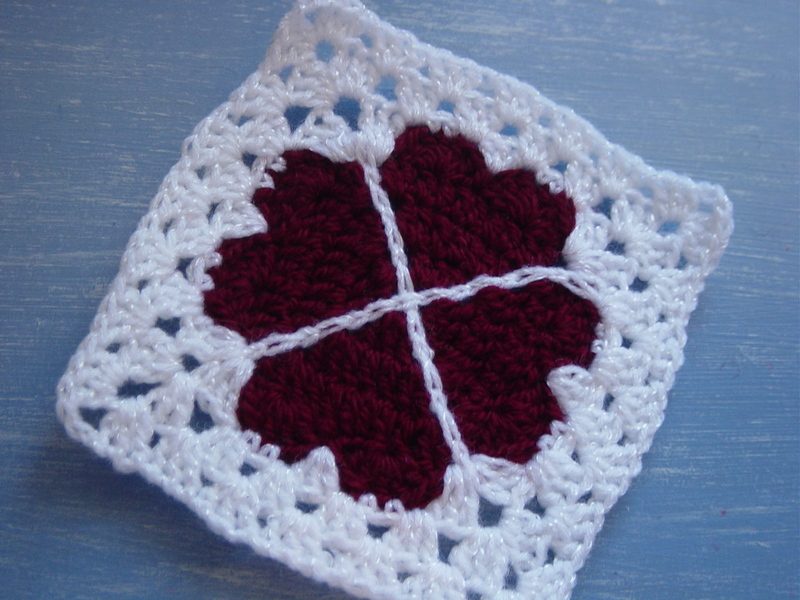 The change from square to round was trickier than the other heart I did from Drops Design, so I did peek at the pattern. I think my reading is getting a bit better, because I could find my place. 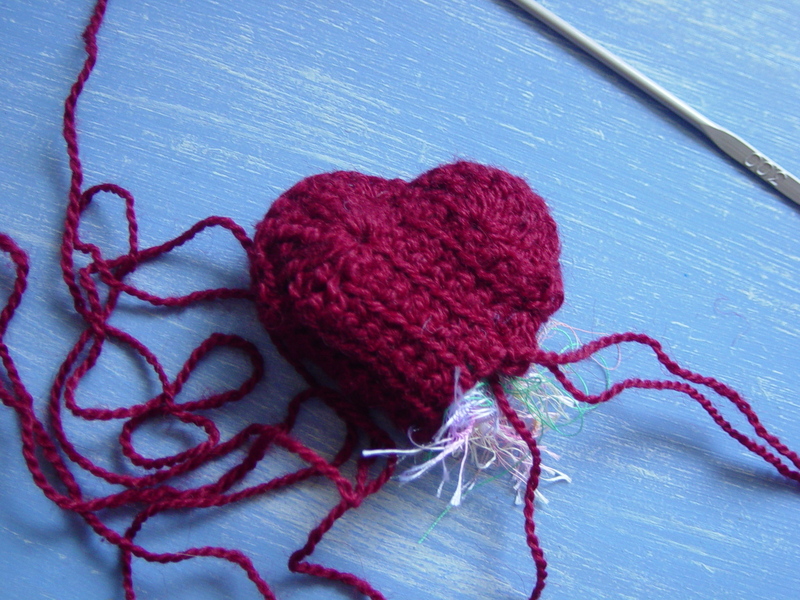 I found a small bit of yarn left over from my childhood and used that, still not sure what will become of this heart yet. 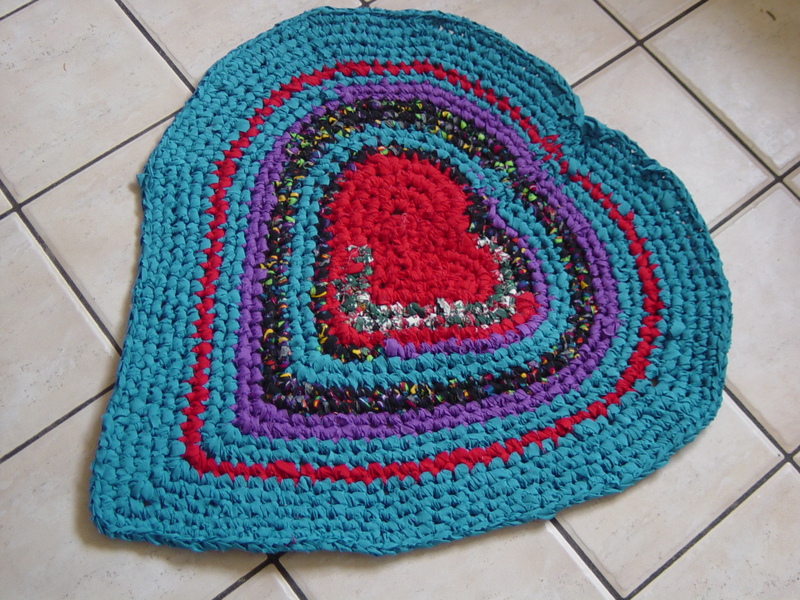 The large heart of fans is impressive, still at first I thought I could try it without reading the pattern, but ended up following it which is from Donna’s Crochet Designs. This one was a little more tricky than the others, but very nice. This one might end up in the trials and samples rug, or perhaps I’ll save it for something special like a bag.